It can’t be accounted for by a small increase in the most expensive crimes either. Over the last 12 months the cost of almost every type of crime has risen in almost every area of the UK. The problems faced by our rural communities are huge, and still growing. 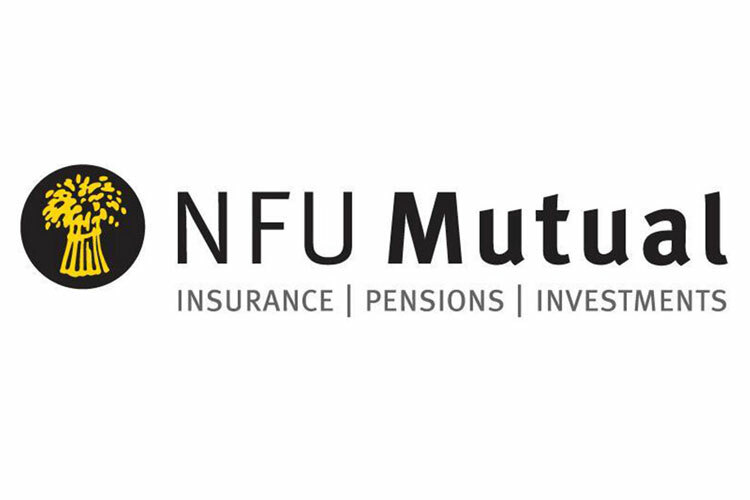 We delve into NFU’s annual Rural Crime Report to learn more. The cost of rural crime is at its highest since 2013. However the picture isn’t quite the same in every part of the UK. 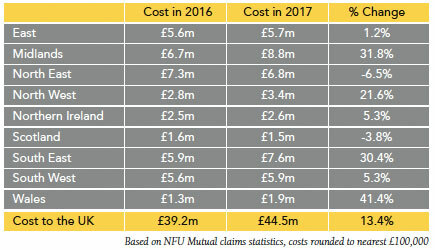 In Scotland in particular, the cost of rural crime continues to fall. The North East has also seen a decline in the cost of theft, while Wales, the Midlands and South East have seen sharp increases. The table below shows which areas have been worst hit. To protect their crops and keep criminals off their land, an increasing number of farmers are bolstering modern security measures with medieval methods seen centuries ago. When used in conjunction with the latest technology, traditional security can be extremely effective. Single entry points. Just like Norman castles, having only one way in and out deters thieves who like a range of exits. Reinforced gates. To protect the entrances to farmyards from ram raids. Barricaded strong rooms. In the same way medieval homesteaders built special rooms to store gold and silver, modern farmers are using them to protect expensive tools and chemicals. High yard fences. To stop intruders climbing over, just like historic stockades. As part of their response to rural crime, Gloucestershire Constabulary has teamed up with local landowners to dig trenches and bunds to stop poachers in their tracks. The sizes of the earth barriers vary according to the needs of the farmer and the land itself. One farm, for example, has a bund of about three feet tall with a trench two feet deep alongside. The barriers already cover a distance of over a mile. 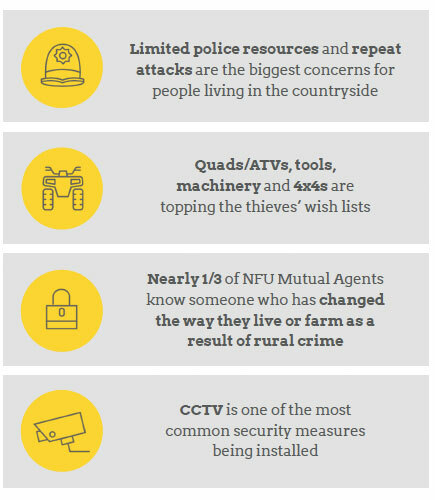 With rural crime on the increase, beefing up your security has never been as important as it is today. Good security is crucial for protecting your property and your business. Of course, locking away everything of any value isn’t always practical on a working farm. 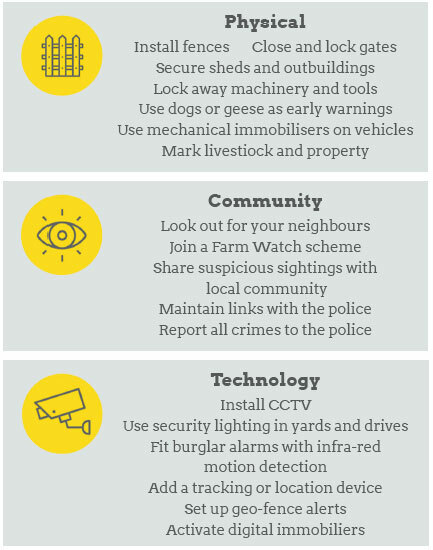 But there are many other measures you can take that will make life for the rural thieves as difficult as possible, and will ensure you’re not an easy target. Security for rural properties falls into three main categories. It’s a good idea to do as much from each as you can. Jim McLaren (Farmer and NFU Mutual Director): “Whether it’s the theft of machinery or livestock, or the deeply frustrating scourge of fly tipping, rural crime has a huge impact on its victims. Having the correct insurance is essential for a good night’s sleep. But even then, the inconvenience and emotional costs are impossible to fully quantify or cover. Prevention is the best tool we have. The installation of even a basic security system, such as a motion-activated camera directed towards the fuel tank, can be enough to send the opportunistic criminal along the track. Social media also plays a huge part. The ability to share images and details of potentially suspicious activity has been ‘weaponised’ by many countryside dwellers.